It’s Time to Take Your Rest Break. Employers typically understand that non-exempt and certain exempt employees are entitled to paid rest breaks. Beyond this fact, rest breaks laws have been widely misunderstood by employers and employees alike. “Every employer shall authorize and permit all employees to take rest periods, which insofar as practicable shall be in the middle of each work period. The authorized rest period time shall be based on the total hours worked daily at the rate of ten (10) minutes net rest time per four (4) hours or major fraction thereof.” See Wage Order 1-2001, section 12(a). The California Supreme Court in Brinker resolved the issue regarding timing of the rest breaks. See Brinker Restaurant Corp. v. The Superior Court of San Diego County (2012) 53 Cal.4th 1004, 139 Cal.Rptr.3d 315. The Brinker court initially addressed the issue of whether an employer is required to provide the first rest break prior to a meal period. On that issue, the Brinker court ruled that California law does not require an employer to provide a rest break prior to a meal period. The Brinker court then opined regarding whether an employer is able to provide two rest breaks before a meal period. The Court ruled that an employer is not permitted, absent “truly unusual circumstances”, to provide two rest breaks before a meal period because “`insofar as practicable, [a rest break] shall be in the middle of each work period. '” (DLSE Opinion Letter, No. 2001.09.17, supra, at p. 4. ).” It further stated that “in the context of an eight-hour shift, “[a]s a general matter,” one rest break should fall on either side of the meal break.” Id. at 1032. 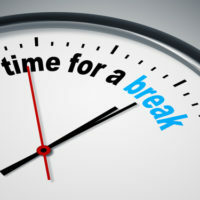 The Brinker court clarified the meaning of “middle of each work period” by ruling that a rest break must be provided within the period in which it accrues. As such, it appears an employee is entitle to separate rest breaks for every four hours of work, or major fraction thereof. 1 Rest Break= 3 ½ hours to 6 hours. 2 Rest Breaks= more than 6 hours to 10 hours. 3 Rest Breaks= more than 10 hours to 14 hours. In the event you have questions regarding your obligations or rights pertaining to rest breaks, you should contact a knowledgeable Employment Law attorney or HR professional.